The prophet Habakkuk had grown weary of the immoral times he was living in. He constantly called out to God asking, “how long?” would the Lord allow such injustice to reign. Finally, God answered the prophet’s grievance. Yes, He saw the immorality and the injustice and He would deal with it in His time and in His way. While at first, Habakkuk had trouble understanding the Lord’s solution, his complaining quickly turned to words of praise; which is amazing considering his situation had not changed and in fact, would become harder with God’s coming judgment. 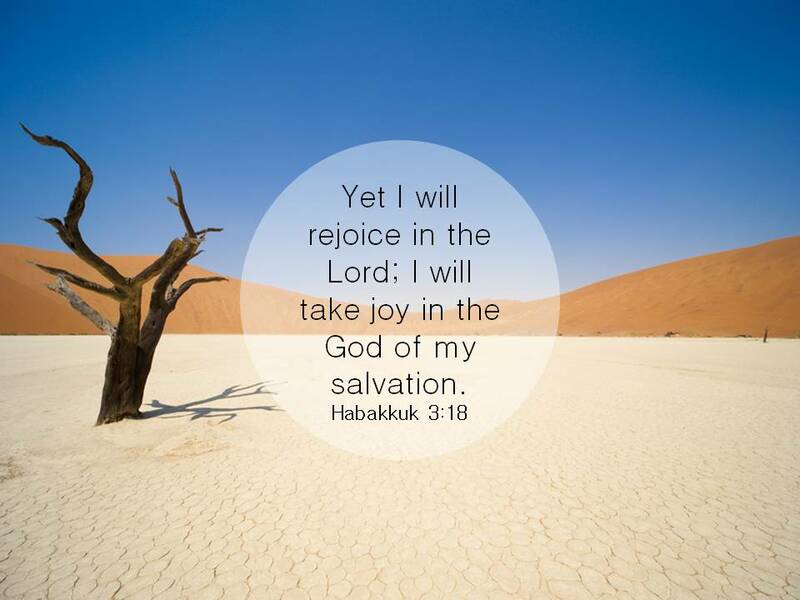 Habakkuk understood something that you and I need to grasp today: our joy is found in God alone. Life is an ever changing set of circumstances, but God is constant; He is always with us, all the time, all the way. So today, rejoice in your God. Thank you friend. Keep sharing the good news. You too, and God bless you and yours. Amen! Our joy is found in God alone. Happiness that comes from the world and our circumstances is a temporary feeling, but His joy is lasting. Be blessed today and find a way to bless someone else! Amen to that! Thank you for sharing.